A participatory budget is a part of the budget of a municipality or a city; its shape depends directly on local residents. Members of the public can submit investment projects, and later vote to select the one to be implemented. The list of projects submitted to vote is generally prepared by the authorities anyway: dear citizen, the choice is yours! ‪The popularity of participatory budgets goes back to the last decade of the twentieth century, when in Porto Alegre, Brazil, participatory budgets provided a solution (as claimed by their proponents) to the issue of citizens’ participation in governance, resolved the problems of corruption, social discontent and even poverty. 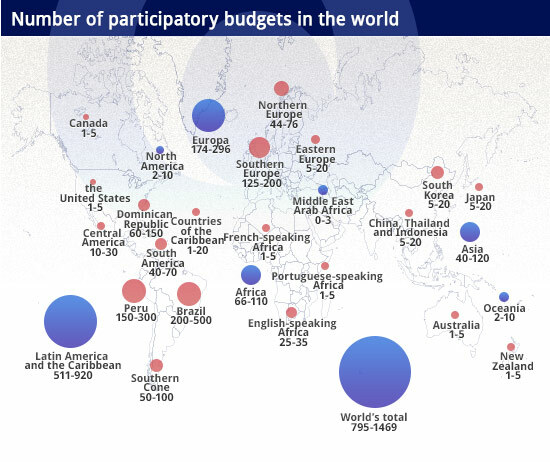 ‪The participatory budget soon became a popular tool for many local authorities, first in Brazil and throughout Latin America, then in Europe, particularly in the south. ‪Asia and North America remained resistant to the idea. ‪The concept became laden with populist ideology according to which citizens were thus granted the right to govern their city; it was claimed that the participatory budget redefines power relations between the authorities and civil society. ‪Its proponents believe that the civic budget allows residents to shape urban policy priorities and long-term goals. ‪They assume, however, that an „inversion of priorities” should be exercised, which means granting additional funds to the most deprived social groups and poverty-stricken neighborhoods. ‪This trend has recently made its way into Poland. 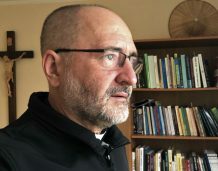 What is more, according to Wojciech Kłębowski of the Civic Institute, author of an interesting study entitled „Participatory Budget – a Brief Instruction Manual”, a debate on the creation of an appropriate bill that would define this practice is under way (Kłębowski is not, however, in favour of this concept). In addition to the historical and ideological background of the participatory budget, the ‪”Brief Instruction Manual” outlines three case studies: Porto Alegre, Cordoba (Spain) and Sopot. ‪Interestingly, the author does not disclose the amounts of participatory budgets in the above cities, or their share in the total amount of city budget. One can only surmise that in Porto Alegre much of the investment budget was subject to public discussion and voting. 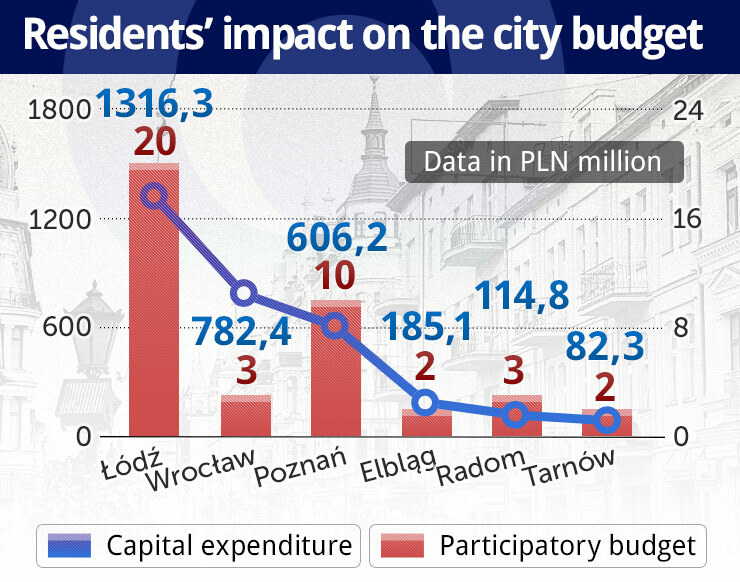 Let us have a closer look at Polish participatory budgets’s share in total city budgets. ‪For example, PLN 3 million were allocated to civic budget in Radom from the total amount of PLN 925.8 million (including PLN 114.8 million for investments) to be spent in 2013. Therefore, citizens can vote to decide on 3 per cent of investment expenditure and 3 per mil of the city’s total expenditure. ‪Among the 300 submitted proposals, there were bike paths, playgrounds, minor repairs and walkways for pedestrians. What about larger cities, such as Wrocław? Given the enthusiasm of the city’s residents, local authorities decided to increase this year’s civic budget from PLN 2 to 3 million and announced that its value would reach PLN 20 million next year. Provided that the city’s total expenditure amounts to PLN 3.5 billion (PLN 782 million of investment) in 2013, next year’s civic budget would represent only 3 percent of investment expenditure (0.3 per cent this year) and 0.6 per cent of total expenditure (1 per mil this year). At the same time, Wroclaw spends nearly PLN 250 million on administration, transport and communication cost PLN 600 million and over PLN 100 million per year is spent on debt servicing. ‪The same is true for Poznań. PLN 10 million of the civic budget equals 0.3 percent of the city’s total expenditure and 1.5 per cent of its investment expenditure. 14 times more is spent on administration, and 11 times more on debt servicing. ‪We have reviewed the budgets of a number of other cities that promise to introduce or have already introduced civic budgets: Chorzów, Łódź and Elbląg. In all of them, civic budget currently amounts or will amount to PLN 1.5-3 million (in smaller cities) and PLN 10-20 million (in larger cities); in each case, it represents less than one percent of total expenditure – usually a small fraction of a percent. In comparison with investment, this amount also falls always below 5 percent, sometimes even below 1 percent of total expenditure. ‪These amounts are therefore marginal; in addition, procedures are carried out by city officials and, possibly, the councilors. ‪They decide on a list of proposals from among which the residents will be able to choose, on the amounts of money available for individual projects and on the maximum value of a project. They even determine how many people can submit a project (a group of 15 minimum). Due to both limited resources and bureaucratic control, residents can choose, in general, between a cycling path or a public garden, a stretch of sidewalk, a parking lot or a playground (although, for example, last year voters decided on the construction of an extension to the local hospice in Poznań). ‪Wojciech Kłębowski thus writes on the website of wiadomości.ngo about the weakness of Polish participatory budgets: they are not based on discussions among citizens. ‪They reinforce the division between the officials setting the „rules of the game” (including the rules for the participatory budget, its subject matter, selection criteria that are applied to the submitted proposals), and local residents who must obey the imposed rules. Consequently, citizens do not become truly co-responsible for the city – this responsibility continues to lie with the officials. ‪The process is not inclusive, that is, it does not engage those citizens who are usually excluded from public debate, and does not cover the whole spectrum of society. What is more, the process does not affect the entire city, as it focuses on neighborhoods and communities – participants do not have any impact on the general priorities of urban development. Finally, the results of the process are not always binding and, in fact, it often takes the form of regular consultations. ‪These seem to be pertinent critical arguments, but of an ideological nature. Taking a pragmatic approach, we shall add to them weaknesses that seem to be at least as important. It has been proven on a number of occasions that local governments sometimes spend money on rather peculiar projects. They are at times met with the approval of local voters when they are part of a candidate’s election campaign. Just as often, at the decision-making stage, residents are not consulted about investments carried out with Polish and European taxpayers’ money, such as the construction of an airport in Gdynia (an example of wasted funds, according to an official statement of the European Commission), the famous thermal baths in Gostynin, the opera house in Białystok, city stadia in Kraków and dozens of other project that are not only expensive to construct, but likely to generate losses in the future. ‪In general, large investments valued at millions of zloty are not subject to discussion and do not depend on the citizen’s decisions. ‪Local residents can neither propose them nor are they able to enforce their implementation. 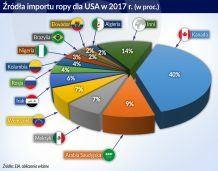 ‪Recently, „Gazeta Wyborcza” presented a summary of large road projects in Warsaw, worth not only millions, but billions of zloty. All are uncompleted and delayed (between several months to over a year), while city officials and the General Directorate for National Roads and Motorways focus their attention on finding excuses to explain the sorry state of affairs. All in all, the only entity responsible for such an outcome, resulting from total ineptitude, is the entity that holds the funds and organizes the investment process. ‪On the one hand, there are PLN 300,000 for a public garden, on the other hand – hundreds of millions frozen in unfinished or pointless projects. PLN ‪43 billion of government expenditure in 2011 is a huge amount of money that is not subject to any civic control other than a ballot paper cast every four years, or a referendum to revoke the authorities of the city (it seems that such a referendum will be held this year in Warsaw). The authors of a study entitled „Assessment of the Local Governments’ Situation” commissioned by the Ministry of Administration and Digitization claim that local governments are the most important providers of public services in Poland and the largest investors. This sector is responsible for every third zloty of public money. In 2011 alone, local government’s current expenditure was more than three times greater than investment and amounted to PLN 139 billion. Local populations have no direct impact on key expenditure, such as employment in public offices and administration costs, schools and public transport – in short, all that determines the state of the budget. Residents of a city are not asked if they wish that their city incur further debts and that increasing amounts be spent on its servicing (at the end of 2012, local governments’ debt amounted to PLN 72 billion). ‪As we have established, debt servicing costs are several times greater than the civic budget of a city. ‪The size of local government debt – on average approximately PLN 2,000 per capita, in many cities PLN 3,000 or more – is 100 to 500 times greater than a city’s participatory budget. ‪Debt issues seem particularly relevant in the context of the new budget perspective. As indicated by a report prepared for the Ministry of Regional Development, cities and municipalities will have problems with the financing of European projects and, if the rules are not relaxed, they will most probably have to dramatically reduce „non-European” investments in order to acquire funds for their own contribution to EU funds. 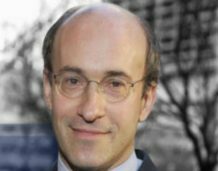 They are already lobbying for the relaxation of rules governing public finances and the debt ratio instead of trying to find a way to increase the operating surplus, and therefore to reduce current costs and restructure the income system. ‪As one of the authors of the report, Remigiusz Górniak, points out, the restructuring of current expenditure is very important, because its share in the budget increases every year. „In fact, we eat up the amount generated by economic growth” – writes Górniak. The widely criticized gigantic increase in the number of public officials in Poland in recent years is due mostly to decisions made by local governments. Citizens have no impact on the situation; control performed by councillors and the vote of acceptance are rather conventional and have no real impact on decisions made by local governments with strong political affiliations. ‪In total, local governments will need a total of about PLN 60 billion of own contribution to European investments in the period between 2014 and 2022. This is not much considering that they spend more than three times as much every year. Theoretically, the financing should therefore pose no problem. Residents, however, have no impact on the reduction of expenditure on local government’s administration. or on the rationalization of educational expenses, which is indeed taken advantage of by small, well-organized groups of people who, for instance, would be directly affected by the liquidation of a school and therefore successfully lobby for its maintenance, even if only several pupils attend it. Local administration makes decision on the basis of its own interests and wants to maintain the status quo; if absolutely necessary, it may increase certain fees and taxes to finance it. ‪A participatory budget is a kind of a game with the public, in which local governments spend billions of public money leaving several millions for residents to play with. ‪Nevertheless, thousands of citizens submit their proposals for civic budgets that are later voted on (2,900 residents voted in Chorzów and 5,000 in Elbląg). ‪This is indeed a fraction of the total number of citizens entitled to vote, representing usually a few percent yet; the issue certainly generates some interest. ‪It is a success of municipal authorities who provide their citizens with a substitute for real decision-making, thus diverting their attention from the real problems of local finances and the lack of effective control over the decisions of local authorities when billions of zlotys are at stake.